Stephanie in customer service is fantastic! I checked up on the progress of an order and we determined that I was missing some seals that I thought I was purchasing in the first place. She explained the car layout and added the seals per my request into the order. Steph told me that none of the pricing will change and that the 3rday shipping option was now overnight at no extra cost. She is a patient sweetheart and you are very fortunate to have such a sensational employee! 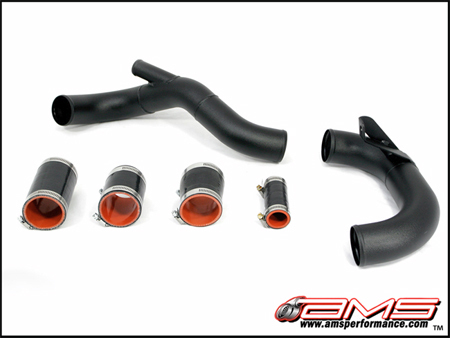 The AMS EVO X Lower Intercooler Pipe (LICP) is a direct replacement for your factory lower intercooler pipe and is made from lightweight 2.5” mandrel bent aluminum tubing. The pipe ends are bead rolled and the assembly is mounted to the core support (in the factory location) to help prevent couplers from popping off under boost. All the factory couplers are replaced with quality 4-ply silicon pieces which can endure 50 + psi of boost! Our LICP is professionally TIG welded in house and is available polished or black wrinkle powder coated. TECH TIP: Complete kit, includes everything for an easy installation. Direct bolt on. This pipe is made to work with an AMS intake. It will not work with the stock air box and is not guaranteed to work with any other intake.